Aluminum utility trailer, 5 x 8 ft. 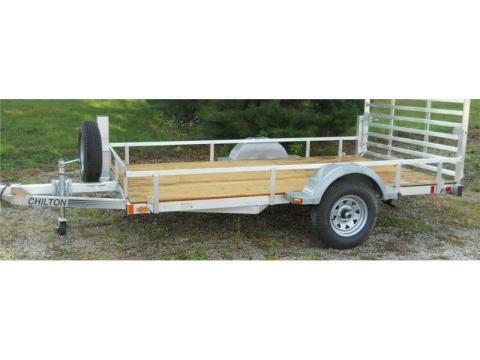 This trailer comes standard with a rail, multiple tie-down points and fold down ramp. Whatever your utility hauling need, we have the answer! Whether it be a steel or aluminum frame, end gates or ramps, wood or metal sides, 2,000 lb. or 3,500 lb. axles, plywood or 5/4 deck board flooring, we have what you are looking for. Chilton Trailers set the standard for rugged and reliable utility trailers. Made of angle frame steel, solid tube steel or a solid tube aluminum frame, all metal in the platforms and the frames is joined together through welding the joints. Unlike cheaper bolt-together type trailers, these welded joints provide the strength and durability you need. Sizes range from 4 - 7 ft. in width and 5 - 14 ft. in length. Our steel UT series offers a standard tilt bed to accommodate easy loading of your equipment and stake pockets for optional wood sides to enclose your load for safe transportation. The aluminum UT series offers either an aluminum rail or stake pockets to suit your individual needs. ST175/80D 13 in. LR "B"